The Csiba of Velke Blahovo (Csiba de Nagy Abony) could be seen as representative of a typical medieval curial family of the Csallokoz region. Of antiquity and deeds of which the noblest Western European houses would be proud of, it is a Hungarian speciality that these families gradually became pauperised and over the centuries lost much of their wealth, though maintained their mentality. The canker in the state of affairs was, simply, Hungarian inheritance laws. This stipulated that all sons and daughters inherited equally, and it thus impoverished most of the Hungarian nobility. The exception of pro-Habsburg Hungarian magnates, for whom the Habsburgs allowed to place their property into an indivisible entail. Just to name a few: the Palffy, Esterhazy, Illeshazy, and Nadasdy families (which all originally came from Csallokoz curial background). This of course created yet another source of discontent between the majority of the nobility and the small coterie of "barely Magyar" magnates, who were viewed with suspicion. Béla, Dei Gratia, Rex Hungariae, universisi praesentem paginam inspecturis, salutem in vero salutari.Quia labilis est hominum memoria, et rerum turbae non sufficit; idcirco solerti ingenio est expertum, ut ea, quae hic longa post tempora noscuntur recordanda, fideli memoriae litterarum commendentur. Universitati igitur vcstrae praesentium tenore cupimus fieri manifestum, quod Chyba, lbur, Heym, Sid, Pocus, Karachun, Illerus, Sath, Hugel, Nolch, Ioanus, Clemen, Stegun et Omodias, ad nostram accedentes praesentiam, obtulerunt nobis litteras felicis recodationis Stephani Regis, quondam Praedecessoris nostri, filii secundi Geyche, in quibus habebatur, quod proauis ipsorum de Bohemia venientibus in Ungariam, terram, in qua fuerant hospitati, dictus.Rex Stephanus eisdem liberaliter contulisset, ut in quacunque libertate vellent, super eadem possent remanere; oblatores igitur dictarum litterarum a nobis petierunt obnixe:quod ipsos libertate Iobbagionum Udvarnicorum nostrorum donaremus. nostrorum donaremus. Nos igitur petitionem ipsorum affectu condigno attendentes, in hac parte, maxime propter hoc, quod sicut fideli nostro Dionysio Palatino, et Comite Bihoriensi, aliisque quibusdam regni nostri Baronibus referentibus percepimus, per venerabilem Partem nostrum, Dominum Andream, illustrem Ungariae regem, eadem libertate fuerant decorati; ipsos ct haeredes ipsorum haeredumque successores, in terra, nomine Oboni, quam per dictum Stephanum Regem eis collatam fuisse dicimus, libertate praedictorum Iobbagionum Udvarnicorum, secundum petitionem ipsorum, duximus vestiendos; ita quod nullus nostrorum successorum ipsos in aliquo, praeter libertatem ultro susceptam valeat aggrauare. Ut igitur hoc ratum et-firmum habeatur, praesentem paginam dupplicis sigilli nostri munimine fecemus perpetuo roborari. Datum anno Domini Millesimo, ducentesimo trigesimo sexto. Septima idus Novembris, regni autem nostri anno secundo. (also note, along with "Chyba" and other noblemen, the name "Karachun", probably the first mention of the Karacsony family, who were subsequently documented later on in the 13th century as Karachon). The above text courtesy of Mr Charles Csiba. 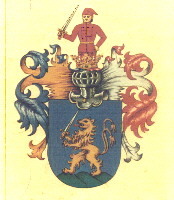 In the 18th century, Janos Csiba was viscount of Moson County, and Michael Csiba was viscount of Pozsony County (Bratislava). In the 19th century a branch of this family lived in Jelka. From this family comes Lajos Csiba (1901 - 1966), a celebrated ornithologist, zoologist and ethnographer of the Csallokoz region. Born to a wealthy landowning family in Tejfalu in Bratislava County, his brother was judge of Moson County. Having studied farming and agriculture, he spent his youth hunting and obsessively observing the flora and fauna of the Csallokoz. He had a legendary trophy and bird egg collection, which sadly was destroyed during World War 2. He published widely into respected Hungarian journals about ornithology, hunting, and game management. But he also wrote a number of publications about local customs, beliefs and superstitions. The Benes Decrees stripped Lajos Csiba and his family of their substantial properties (please see my blog www.benesdecrees.blogspot.com) - but he worked modestly in his home village until his early death, and managed to build another great ornithological and zoological collection. Source: Pomichal Richárd: Csiba Lajos emlékezete. (In memory of Lajos Csiba - a biography) In: Őszi szarvasbőgések, tavaszi szalonkázások. Dunaszerdahely, Csemadok Dunaszerdahelyi Területi Választmánya, 2003.